On the west side of Victoria Road, the Italianate-style Almshouses form asymmetrical U-shaped composition around Alexandra Square, which is one of the few open areas in the village. It was neve rdesigned as an informal recreation area, but for the enjoyment of the almshouses’ residents. There were originally 45 almshouses, each with an oven, boiler and pantry, together with a single bedroom. 41 of the properties remain, as four were absorbed by the expansion of the (hospital) Infirmary and Dispensary. The planned capacity was 60 residents. Although many of the occupants were former employees, this was not a necessity. The requirements were a good moral character and incapacity for labour, by reason of age, disease or infirmity. Designed by Lockwood and Mawson, the houses are of one and two storeys with alternate gabled and entrance bays. The end blocks and four intermediate blocks are two-storeyed and gabled. The three-bay, two-storey central block has gabled outer bays with enriched tympana, each with a roundel with the initials ‘TS’ to the left and ‘CS’ to the right (Titus Salt and Caroline Salt). It is also inscribed with Salt’s family motto, Quid Non Deo Juvante, with a palm and oak leaf support and small alpaca crest. The houses are entered by paired entrances with four-panel doors in open porches with central colonnettes. In the porches of Nos.38 and 35 Victoria Road are two upright stones bearing the names of residents and, on one dated 1868-75, there is the legend ‘Here the wicked cease from troubling and the weary be at rest’ and the other 1875-78, bears the quotation ‘Blessed are the dead which die in the Lord’. 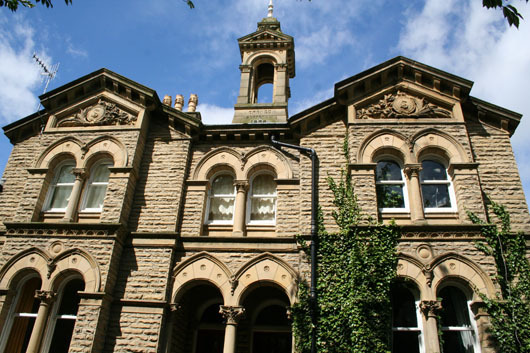 To the east side of Victoria Road is an ordered and near symmetrical Italianate-style facade of 14 houses, consisting of alternate gabled bays and entrance bays. Again, the central three-bay block has gabled left and right bays with enriched tympana, each with a roundel inscribed with ‘TS’ to the left and ‘CS’ to the right. The central square bell-turret with an enriched pedimented top is inscribed ‘Opened September 1868’. Stone ashlar piers and square-section cast-iron railings dignify both groups of houses.When built, this small group of homes had a chapel of its own, and good views from the central garden down to the Mill, then beyond to the other side of the valley and up towards Baildon Moor. 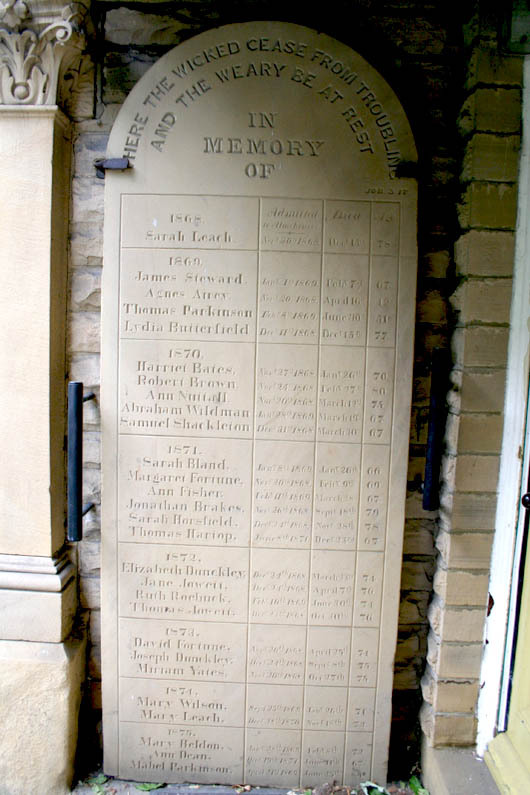 In 2001 the Almshouses underwent phased refurbishment to windows, doors, roofs and chimneys, as part of a full programme of repairs funded by the City of Bradford Metropolitan District Council, English Heritage and the Heritage Lottery Fund. The properties are fully occupied. 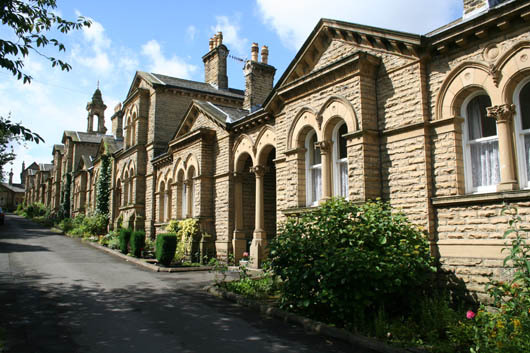 Saltaire Almshouses on Victoria Road. Note the initials TS and CS on the building.